This blog post has been HIGHLY REQUESTED as I have shown a few Instagram stories of us enjoying our homemade tacos! We were inspired to make our own tortillas after watching the amazing Netflix show The Final Table, and combined them with our other taco faves! We’ve made tacos with chicken thighs, pulled pork, steak and chicken breast and we have found our all-time fave recipe which I will show you below! However, feel free to change it up as desired, switch out meats, add different toppings etc. So growing up we had tacos on fried corn tortillas which still scar me to this day, or store-bought tortillas which honestly, since making our own tortillas, I cannot go back to! They’re also filled with garbage that you really should not put in your body. We are still perfecting our steak and other fillings, so stay tuned for those recipes in the future! For now, this is our current fave! Make the Pico De Gallo. 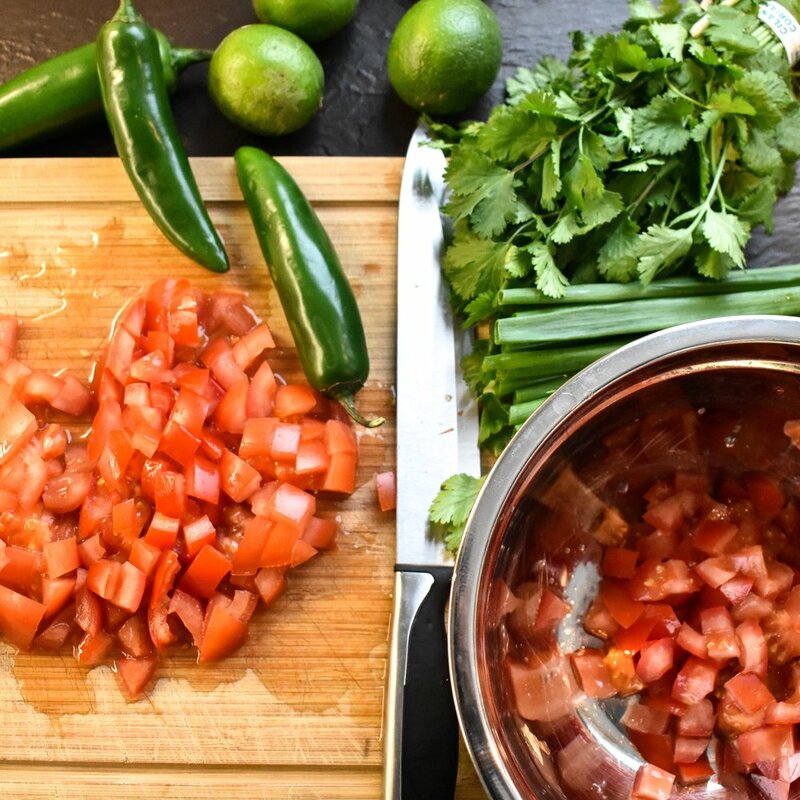 Chop your vegetables, chopping extra cilantro, limes and jalapenos for the rice, the marinade and to have as toppings for your tacos and put them aside on a plate. Place the finished Pico in the fridge while you prepare your other components. Prep your marinade add the chicken and place aside in the freezer bag to marinate while you are making your tortillas. If you have a partner, get them to begin preparing the toppings you will want for your tacos. We grate a bit of cheese (not needed in my opinion but its an option) get out all the hot sauces, greens, etc. Get your rice started. We use a rice cooker so we literally don't have to think about it at all and when it's done it stays warm until whenever you're ready to plate. Mix up your tortilla dough and begin forming your tortillas. Once your tortillas are ready to throw in the pan, that’s when we usually start the chicken. We always at least double the tortilla recipe, so once the chicken is done usually the tortillas are too. 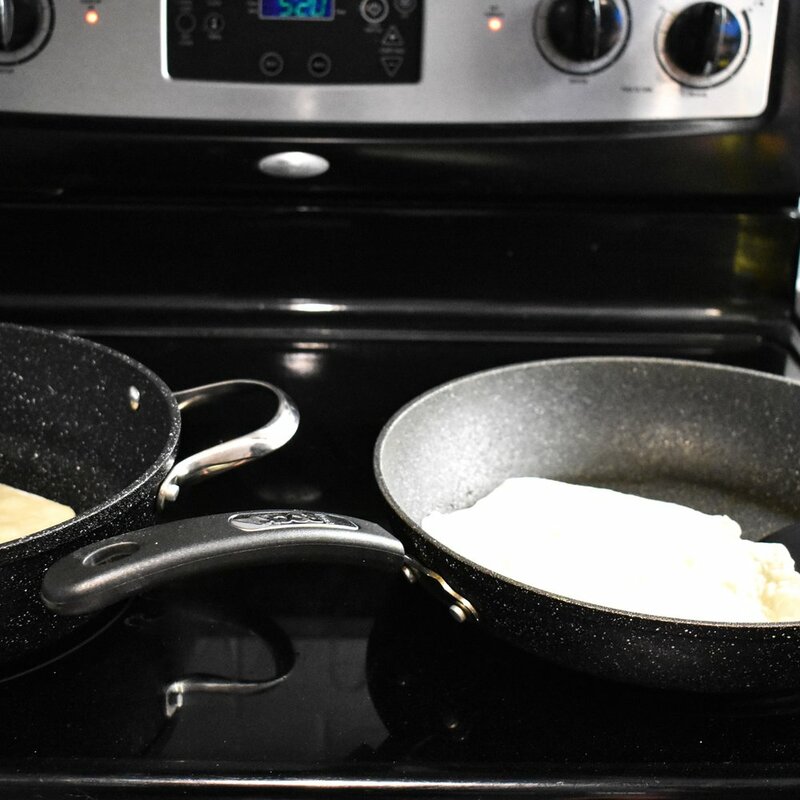 One pan on the stove for tortillas and one pan for chicken. Chop up chicken into small pieces, build your tacos and enjoy! Mix all dry ingredients into a large bowl and whisk together. Make a divot in the middle, pour in the oil then the water and mix together until combined. 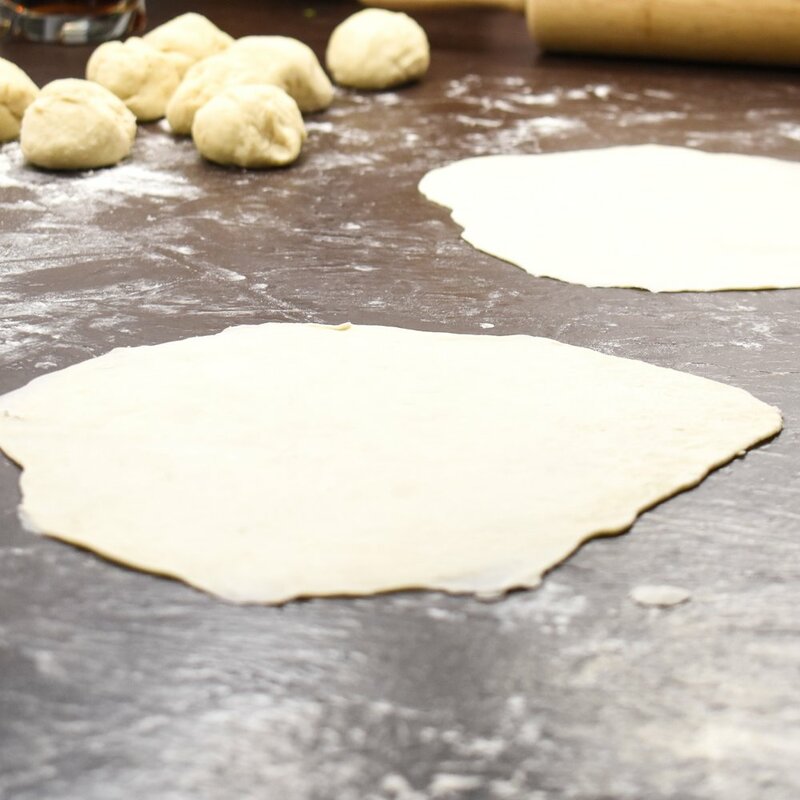 Remove the dough from the bowl, place onto a floured surface and knead until combined and smooth, adding flour or water if necessary to make a non-sticky and smooth dough. Let sit for 10 minutes, then divide into 8 equal pieces and roll them out until they are thin and flat. Place a small drop of oil into a frying pan on medium/high heat and cook for about 30 seconds a side until they start to get brown. Continue this process until all tortillas are complete and enjoy! Chop all ingredients and place in a large bowl, finishing with the lime juice and stir to combine. Chop onions, jalapeno and cilantro and place in a large freezer bag. Add the chicken, spices, oil and the juice of one lime and shake until combined. Marinate for a couple hours or just while you prepare your tortillas. Pan fry in a frying pan on medium-high heat flipping every couple minutes until nicely browned on both sides, should take around 20mins. Use a meat thermometer to ensure properly cooked. Cook white rice in a rice cooker, adding three bay leaves. When done and ready to serve, fluff rice and add chopped cilantro and lime juice. You can totally put whatever you prefer on your tacos, but this is what we love most on ours! Feel free to add cheese, sour cream, salsa, etc. I am a HUGE lover of sour cream, however in my honest opinion, with all of the amazing flavours from the chicken, rice and spices, its just extra calories that are taking away from the amazing flavours you get from all of the ingredients. Again, your taco, your call. But try this out, I think you will love it. And that’s it! It sounds like a lot of work, but it's really not, and especially after you’ve done it a few times and get used to the order of it all! We’ve now made Sunday nights our family taco night where M will help Hubs roll and make the tortillas while J will help me prepare the toppings. The boys look forward to it just as much as we do and it's a great way to spend time as a family doing something inexpensive and fun! Definitely give it a try and let me know if you love it just as much as we do!